AGROCAMPING, S.L., [hereafter LAS PALMERAS], is the owner of the web page laspalmeras.com, and will act exclusively as the manager of the contents of the present Web, addressed at: C/ Bisbe Sivilla, nº42 – 08022 BARCELONA, NIF B63485247, Mercantile Register in Barcelona Book 37468, Section 137, Page B-300145 Inscription 1ª, is responsible for the management and functioning of the Web previously mentioned. If you would like to contact us, you can do so by post at the previously mentioned address, or by e-mail at: laspalmeras@laspalmeras.com. If you use the web you are considered a user and this implies full acceptance without any reservation of every and each point in this Legal Notice, published by LAS PALMERAS, from the moment the user accesses the web. In consequence, the user must read carefully the present Legal Notice every time he or she wishes to use the Web, as these may be modified. LAS PALMERAS, is only responsible for its own web and any access to webs by links or any information offered by third parties is not the responsibility of LAS PALMERAS. Any use of links or access to a web not owned by LAS PALMERAS is at the users responsibility and LAS PALMERAS does not recommend nor guarantee any information obtained by a link through a third party which comes from a web that is not from laspalmeras.com, neither is it responsible for any loss, claims or damages derived from the use or bad use of a link or the information obtained through it, including other links or webs, interruption of service or in the access, or trying to use or the incorrect use of a link, even if the connection is via the Web laspalmeras.com or by accessing the information by other webs from the same Web page. The information and the services included or availability by the Web could include errors or spelling mistakes. Periodically changes in the contents will be made. LAS PALMERAS, can introduce improvements and or changes in its service or contents at any time. LAS PALMERAS, is not responsible if there are interruptions or if the services and contents offered on the internet do not work adequately, regardless of the cause. Likewise, LAS PALMERAS is not responsible for, the internet going down, loss of business due to these failures and temporary electricity power cuts or any other types of cuts. LAS PALMERAS, does not declare nor guarantee that the services or contents will not be interrupted or free of errors, and that they will be repaired, or that the service or the provider will be free of viruses or any other damaging component, whilst LAS PALMERAS, will do its utmost to avoid these types of incidences. If the user takes some decisions or carries out actions based on information included on any “websites”, it is recommendable to check the information by consulting other sources. 1. The structure, design and way of presenting the elements (graphs, images, files, logotypes, colour combinations and any element susceptible to protection) are protected by intellectual property laws, owned by LAS PALMERAS. 2. It is prohibited to reproduce, transform, distribute, communicate in public, make publicly available and in generally exploit in any form partially or totally the elements referred to in the previous section. These acts of exploitation can only be carried out if authorised by LAS PALMERAS, and if this were to be the case, there must be explicit reference to the fact that LAS PALMERAS is the intellectual owner of the material. 3. Only documental material produced by LAS PALMERAS is authorised for private use, and in no case, can the material be deleted, changed, eluded or any of the security systems installed be manipulated. 4. It is forbidden to link to the final pages, the frame and any other similar manipulation. The links must always be to the principle page or homepage laspalmeras.com 5. Distinctive signs (brands, commercial names) belonging to LAS PALMERAS, are protected by industrial property rights and the use or manipulation of them is forbidden except if there is written authorization by LAS PALMERAS. According to the data protection act of Regulation (EU) 2016/679 of 27 April 2016, we inform you that personal data given via the forms, and likewise your e-mail address have been included in our file titled LAS PALMERAS, S.L. [hereafter, LAS PALMERAS], at the business address of: C/ Bisbe Sivilla, nº42 – 08022 BARCELONA, NIF B63485247, Mercantile Register in Barcelona Book 37468, Section 137, Page B-300145 Inscription 1ª, E-mail laspalmeras@laspalmeras.com, with the objective of attending your consultations and sending you information related to the services offered by LAS PALMERAS. We inform you that the data could be used to send you commercial communications, in any format, and this could be related to any other services offered by our business which might be of interest to you. If you should at any time oppose this type of communications, please send us an e-mail address to pd@laspalmeras.com indicating the subject as “UNSUBSCRIBE FROM THE DISTRIBUTION LIST”. Likewise, you can exercise the right to access, rectify, cancel, opposition, portability and where appropriate limitation, according to the terms established by REGULATION (EU) 2016/679 by presenting or sending an application in writing to: C/ Bisbe Sivilla, nº42 – 08022 BARCELONA, or by e-mail to: pd@laspalmeras.com and with a photocopy of your ID or similar documentation indicating the subject as “DATA PROTECTION”. a. For the treatment [WEB USERS / NEWSLETTER], offers the information demanded by the interested parties via a form or questionnaire on the web page laspalmeras.com. b. Answer questions that have been formulated. c. Send you information about our services offered on the website laspalmeras.com. However, you can at any moment reject this type of service by sending an e-mail to pd@laspalmeras.com indicating the subject as “UNSUBSCRIBE FROM THE DISTRIBUTION LIST”. The title holders of the data contained in the treatment [WEB USERS / NEWSLETTER] as well as the holders of the data contained in any of the files held by, LAS PALMERAS, can contact the entity, as the person responsible for the file, with the objective of being allowed to exercise their right of access, rectification, cancellation, opposition, portability and where appropriate limitation, with respect to the data incorporated in the treatment. A.- The right to access is to be exercised annually, except if the party interested shows legitimate accreditation. When exercising the right of access, the interested party can opt for the following systems in order to consult the file treatment: – sending an email to: pd@laspalmeras.com. – writing a letter addressed to: LAS PALMERAS, C/ Bisbe Sivilla, nº42 – 08022 BARCELONA LAS PALMERAS will proceed to notify its decisions within a timeframe of a month. If it were to be accepted, the interested party would be able to access the previously mentioned information within 10 days after its notification. B. – The right of rectification and cancelation can be exercised, conforming to the following previsions, whenever the interested party considers that the data collected in our files is inexact, incomplete, inadequate or excessive. If this is the case, you can exercise these rights via one of the means previously anticipated. LAS PALMERAS will proceed with the rectification or cancellation within 10 days of receiving the application. C.- The right of portability they may be exercised, in accordance with the following provisions, provided that the interested party considers that the data collected in our treatments must be returned to the data holder or to another third party (Treatment Manager). D.- The right of limitation may be exercised, prior to opposition right for the treatment of their data, and that until the Opposition Law is not resolved, the treatment of them will be limited. LAS PALMERAS reserves the right to modify the present policy with the objective of adapting it to the legislative or precedents changes, as well as those that could be derived from the “Code Type” existing in the material. Such changes will be communicated within the necessary time on our Web page, and it can ask the affected parties for their consent if it is believed that it does not have the consent according to the present policy. If you should have any doubt, question or comments referring to the present regulations, please do not hesitate to ask about them by sending a communication to: laspalmeras@laspalmeras.com. What are cookies? Cookies are files that are installed on the user’s web browser or devices (smartphone or tablet) as you browse the website pages and are used to store information about your visit. Level 1: Cookies strictly necessary for the provision of the service requested by the user.  Level 2: Performance cookies (anonymous) required for content and browsing maintenance. You are only informed of their existence. 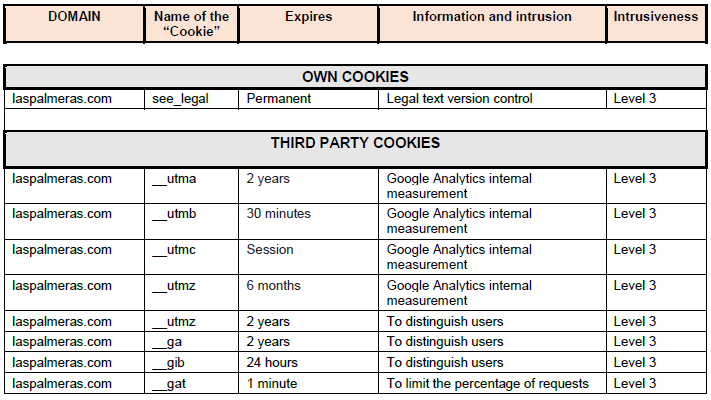  Level 3: Cookies managed by third parties allowing the user to be tracked through other websites that are not the owners of that website. They generally correspond to advertising or analytical cookies which identify the user in a unique and obvious way.